What do you do when your daughter wants to see her best friend-the one who helped her through her dad’s last deployment? If you are within a 100 mile radius you load up the Family and make it happen. We all met up at a hotel outside of the Air Force Academy and soon saw that the rest of the tribe was getting restless with simply hanging out at the hotel. In the previous week, I had just missed an opportunity to check out the Air Force Academy. I had been on location surveying possible upcoming training areas for use in my new assignment. This week, I saw a small window in which to take the kids on a little discovery learning. The kids were loaded in the van, including my 11 year old’s battle buddy, and we were off. We drove around the grounds and enjoyed a great view of the Cadet barracks along with the Chapel. My five year old was fascinated with the statues in what we assumed was the quad. Being an OCS graduate, I didn’t know all the ins and outs of this cherished piece of ground, but I knew that many a cadet had spent time doing some type of military routine in this space and participating in time honored traditions. I had heard stories from West Point, and I knew the USAF Academy had similar stories. In the last two years I’d spent time in close proximity to a high number of Academy grads while working with the Air Force. On reflection, I felt a pang of guilt that I hadn’t asked more about their experience in Colorado. Then it hit me. Professional reading was about to pay off. I had read Fighter Pilot: The Memoirs of Legendary Ace Robin Olds. The book was compiled by his daughter Christina and Ed Rasimus. It had served me well as a liaison to the Air Force and helped me to understand a culture that was foreign to me on many levels. Now, it served as a reminder that Brigadier General Olds was buried on the grounds of the Academy. 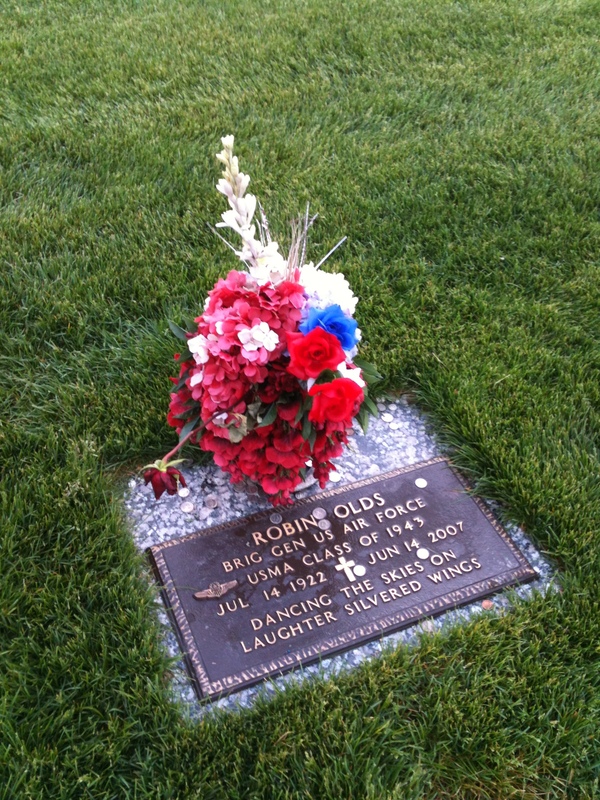 Our band of seven soon found ourselves in the cemetery and soon after, I was standing at the grave site of Robin Olds. The first question one of the children asked about was the nickels spread over the grave. The grass and headstone were laden with nickels scattered over them. All I knew was that it was significant and this was my chance to tell the children about the impact that this one man had on the Air Force and his place in history. I had worked closely with fighter pilots and know their heritage is near and dear to their hearts. Having been given the privilege of experiencing a naming and also taking the stick in the back seat of an F16 D as an Army Ground Liaison Officer, I knew enough about the Fighter community to understand the significance of the moment, and the value in sharing it with my family. Just being exposed to the camaraderie of a fighter squadron and witnessing the reverence they held for one of their heroes taught me a lot about leadership. Ed Rasimus, who assisted Christina with compiling her father’s memoirs, sums up the tradition best in a blog post entitled “Finding the Gravesite.” He notes the importance of traditions and passing on their meaning. My children and one of their friends left the cemetery knowing a little more about a man who served his country and made a difference. I would highly recommend taking the time to read about Robin Olds and his legacy. You too might find yourself respectfully “Throwing a Nickel” out of tradition and in honor of a legend. now and finally got the bravery to go ahead and give you a shout out from Porter Tx! Just wanted to mention keep up the excellent work! I met General Olds at the base in Ubon Thailand, enjoyed a short visit with him at the Exchange. I will never forget his strong image he presented that day. I was working at the radar unit at the end of the runway and we could see all the flights go out and come back. He was a Bird Col. at that time. Although a short talk, I still remember him as a very strong person who will be missed, but never forgotten. God Bless him and family.